This family of 71 species of insectivorous and carnivorous marsupials occurs in all the major terrestrial habitats of Australia and New Guinea, including Australian deserts. 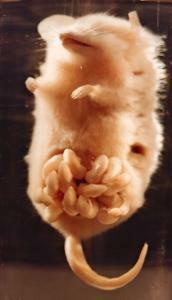 Dasyurids are generally terrestrial or scansorial, i.e. spending most of their time in trees, and principally nocturnal or crepuscular, i.e. mostly active at duck or dawn. Dasyurids range in size from 3 grams to 8 kg; most weigh less than 250 grams. 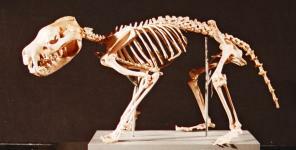 The larger dasyurids, such as the Tasmanian devil and quolls, subsist mainly on carrion, particulary dead wallabies, wombats or sheep. They may also take poultry, new born lambs and sick sheep. Although so small that they include the smallest mammals in the world, the small dasyurids are very ferocious, feeding on live insects, other invertebrates, fledging birds, even small mammals and lizards. The dentition consists of three pairs of similar sized lower incisors, well developed canines, six to seven sharp cheek teeth with which they can grasp and quickly kill their prey and chew it into small pieces. Little is known about dasyurid social organisation. Most appear to be solitary except in the mating season. Their calls appear to be very important: the males can be heard calling throughout the mating season; females call only during periods of high receptivity. Their calls may not only help in finding mates but also warn off unwanted intruders. The females of the very small species only ovulate once a year as the energy required is too much for them to ovulate more often. Small species tend to have more teats and larger litters than large species. Dasyurids use a variety of nest sites: tree hollows, burrows, hollows in rotting logs, rockpiles and rock crevices. The Tasmanian devil Sarcophilus laniarus (harissi) is a stocky animal with brown to black fur, a white throat and white spots on its sides and a pink snout. Feeding on carrion, the devil fills the ecological niche filled by hyaenas in Africa. The devil's head is large with a relatively short snout with massive jaw crushing muscles and robust, sharp premolars and molars that enable the animal to consume all parts of a carcass, including the skin and all but the largest bones. Its dental formula is I4/3; C1/1; PM 2/2; M4/4. 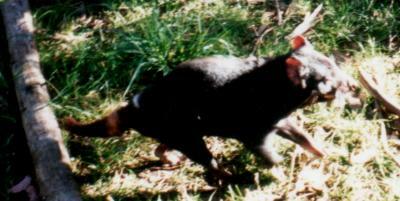 Devils are solitary, nocturnal animals, although they congregate at feeding sites. They are not territorial but are aggressive towards intruders, deterring the trepasser from approaching by growling and screeching. This may be how they got the name of devil. The females are smaller and lighter than males. Devils have been known to live up to nine years in the wild. Devils breed in march; the gestation period is a month; females give birth to 2 -4 young which remain in the pouch for 4 - 5 months. The offspring are weaned around nine months and disperse when about a year old. Uniquely, the female's pouch remains completely closed while she is breeding. Male and female devils live in nests of bark, grass and leaves during the daytime. Their dens are usually made in hollow logs, caves or burrows. Tasmanian devils are not considered to be endangered species as 'road kills' provide them with a large supply of carrion. Eastern quolls are ground-dwelling, carnivorous animals, about the size of a small cat and quite ferocious. They weigh about 1.5 kg and can grow to 70 cm in length. They have thick, soft fur, light in colour, and a bushy tail. Widespread in Tasmania, occupying most biomes from rainforest to alpine habitats, they appear to prefer grassland. They are believed to be extinct in Australia. 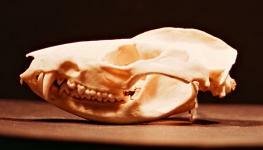 Skull of Eastern quoll showing well developed canines and crushing cheek teeth: I4/3; C1/1; P2/2; M4/4. Eastern quolls mate in May and June at 12 months old, the gestation period is approximately one month. The animal is unusual as it gives birth to thirty young, despite only having six teats, and only the first, fittest, six young to reach the teats survive. The young leave the pouch after 10 weeks and remain in the nest until they no longer receive parental care when they are between 18 - 20 old. 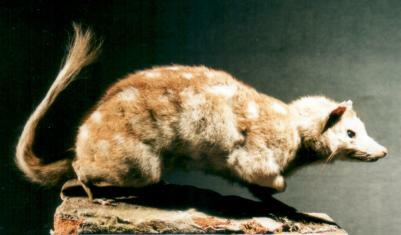 The Eastern quoll is not considered to be endangered but is being closely watched by conservationists. Their habitat is being destroyed to make way for agriculture. They often fall foul of cars and are prey to feral dogs; feral cats compete for the same resources. The kultarr is one of the more unusual dasyurids. It is very small - only 8 - 11 cm high - and looks like a cross between a mouse and a kangaroo. Kultarrs can run fast, jumping off their hind feet and landing on their front feet. Their fur is long, fine and grey, covering the entire body. They live in arid climates and are nocturnal. Kultarrs are carnivorous, like other dasyurids, eating insects, other invertebrates and small vertebrates. Kultarrs, unlike other dasyurids, have a pouch that opens to the front. They breed in winter, giving birth to 3 - 8 offspring. They are considered an endangered species. The fat-tailed dunnart is a small, nocturnal animal only 6 - 10 cm long, found in Southern Queensland, Australia. It is carnivorous, eating different types of invertebrates, with its large canines and crushing cheek teeth. 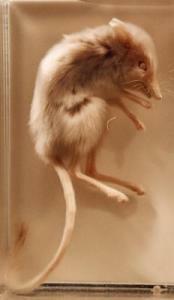 Dunnarts, or Narrow-footed marsupial mice, live in small sociable groups although in captivity the female will often kill the male, implying these animals are territorial. Fat-tailed dunnarts cannot regulate their body temperature and in winter often live with other species to keep warm. Dunnarts are sexually mature at 6 - 8 months. The females produce 2 - 3 litters, after a gestation period of 13 - 16 days. The breeding season may extend to 8 months between July and February. Although the chance of reproductive failure may be high due to food shortages, having several litters over an extended breeding season over such a long period optimises the chances of breeding successfully. Once dubbed the 'vampire marsupial' for its attacks on poultry, the miniscule, insectivorous forest dwelling, brush-tailed marsupial mouse's numerous very pointed teeth are adapted to grasp and process insects. It has a typical primitive dental formula of I4/3; C1/1; PM3/3; M4/4. The brush-tailed marsupial mouse has a unique reproductive strategy. Females breed annually; matings occurring over a short period of 2 - 3 weeks. After a long gestation period of 30 - 40 days, the female gives birth to 6 - 12 young which are not weaned until they are three months old. In this way, lactation and weaning of the young coincides with peaks of invertebrate food which occur reliably throughout the summer months. While the females may live for two to three breeding seasons, the males sacrifice so much energy to breeding that they die at less than a year old. 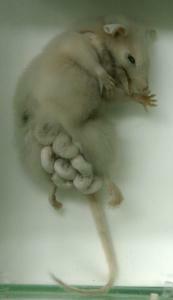 A brush-tailed marsupial mouse with young attached to her teats.